POLITICAL TIDBITS: Two articulate young leaders---lawyer Greco Belgica and lawyer-CPA and ex-Biliran Rep. Glenn Chong---hammered on unconstitutional use of estimated P140B in presidential pork and P10B PDAF, as well as discarding by Comelec-Smartmatic of four safety features of PCOS, that undermined credibility and integrity of two past elections. Now that DBM's Abad said no DAP is ever released without P-Noy's ok.,what's Ombudsman to do? Many hundreds from various faiths at historic Kalayaan Hall pledged support for advocacies of Belgica/Chong, moving Arch.Oscar Cruz to tears. 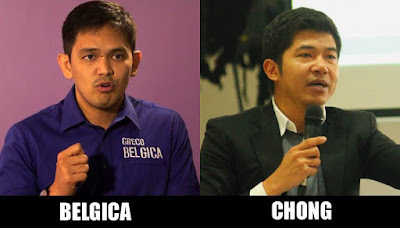 Two articulate young leaders---lawyer Greco Belgica and lawyer-CPA and ex-Biliran Rep. Glenn Chong---hammered on unconstitutional use of estimated P140B in presidential pork and P10B PDAF, as well as discarding by Comelec-Smartmatic of four safety features of PCOS, that undermined credibility and integrity of two past elections. Now that DBM's Abad said no DAP is ever released without P-Noy's ok.,what's Ombudsman to do? Many hundreds from various faiths at historic Kalayaan Hall pledged support for advocacies of Belgica/Chong, moving Arch.Oscar Cruz to tears. Last Wednesday from 1-4 pm., hundreds of citizens from the Catholic, Protestant and Muslim faiths gathered for a “Political Vigil” called by the advocacy group called "Reform Philippines Coalition" at the historic Kalayaan Hall in Club Filipino in San Juan, Metro Manila. It was marked by stirring and even bombastic speeches, emotional inter-faith prayers and even the shedding of tears by a good number, most notably by Archbishop Emeritus Oscar Cruz of Pangasinan. The white-haired archbishop confessed to the crowds that he was already very tempted to give up hope about this country, but after hearing all the demands from the conferees to the powers that be and the pledges for action, “nabuhayan ako ng loob,” Cruz declared, to great cheering. The large gathering demanded two things from this administration: "Public Accountability and Transparent and Credible Automated Elections.". As articulated by Greco Belgica, lead protester in the landmark 14-0 Supreme Court decision of 2013 that ruled the PDAF and the Disbursement Acceleration Program (DAP) of the Executive as unconstitutional, the coalition demands THE IMMEDIATE IMPLEMENTATION OF THE SC DECISION ON PORK BARREL. Belgica, a lawyer and Christian faith leader, called on the Ombudsman and the Secretary of Justice to make good their investigation, prosecution and suspension of guilty parties responsible for the misuse and abuse of these pork barrel funds and lump sums. Recall that it was Sen. Jinggoy Estrada who, two months after Chief Justice Renato Corona was convicted by the Senate after his impeachment by the House of Representatives, made the startling allegation that funds running from P50 million to as much as P100 million were distributed to each of the senators as incentive for their conviction vote of Corona (only three senators did not partake of the bounty---Senators Joker Arroyo, Miriam Santiago and Panfilo Lacson). Estrada’s revelation blew the lid off the DAP which was formally offered to the senators in writing by then Appropriations Chair Franklin Drilon immediately after the Corona trial. Interestingly, the day after Greco Belgica’s power-point blast against presidential and congressional pork barrel, the Ombudsman came out in various newspapers that DBM Secretary Florencio Abad and his deputy, Undersecretary Mario Relampagos, are undergoing investigation in connection with these twin evils. The Ombudsman asserted that these two budget officials could be held liable for technical malversation, inasmuch as transfer of funds by the Executive was undertaken without congressional approval in the national budget, as demanded by the Constitution. It will be recalled that during the SC hearings on Belgica's suit vs. presidential pork, Abad estimated it to be as much as P140B, but the Ombudsman was quoted recently as placing at only around P31.9B the unobligated appropriations without congressional approval from 20l1 to 2012. The fund totals may be in question, but this early several things are evident. One is that “investigation” about these lump sum disbursements could just be dribbled in this administration, so that no real action is taken. Secondly, and more important, President Aquino appears to be absolved by the Ombudsman in the investigation and possible prosecution for unlawful transfers of these huge amounts---when it’s logical and obvious that huge lump sums such as the “Malampaya Fund” and the “presidential social fund” are “presidential pork” that Abad and Relampagos COULD NOT HAVE JUGGLED WITHOUT AUTHORITY FROM THE PRESIDENT. In fact, the Daily Tribune banner news today quotes Abad as categorically naming the President as the one who ordered him to use those funds in cross-transfer. It remains to be seen, however, whether the Ombudsman would pursue these unconstitutional fund-transfers more decisively. This issue recalls the “shouting match” that the Times columnist with enviable Palace moles, Kit Tatad, wrote about and hows it was all about the blame game between boss and subordinate. True, P-Noy enjoys immunity from suits while he is President, but as legal luminaries point out, he is not immune from investigations. The Ombudsman cannot dodge investigating P-Noy. Given his ultimate responsibility for his presidential pork, P-Noy has to make his anointed candidate, Mar Roxas, win at all cost, as the latter is the only one who could go easy on P-Noy's post-presidency lawsuits and protect him from a GMA scenario. Hence P-Noy's order to LP solons to drop their own respective campaigns and concentrate on propelling Roxas’ candidacy to victory. Makes sense. Mar appears to be moving indeed. Fomer Biliran Rep. Glenn Chong, a lawyer-CPA, is another of my youthful heroes, having devoted five years of his life to the cause of clean and honest elections, after himself suffering from electoral cheating through the PCOS machine in 2010. Articulate and passionate about his advocacy for clean and honest elections---"no cheating"---Glenn has been tirelessly going around the country at his own expense, awakening a populace largely ignorant of the intricacies of the Comelec-Smartmatic syndicate's shenanigans. Glenn has also confronted dishonest Comelec officials right in the Joint Congressional Oversight Committee in the Senate and stumped them. At Club Filipino Chong argued by means of audio-visual props for the Comelec to return four safety features of the PCOS machines, as provided by R.A. 9369, the “Automated Election System Law.” These were “removed outright or effectively diluted” during the past two elections---thus greatly undermining their integrity and credibility. These discarded safety features were l). the Source Code Review (SCR) that provides secret instructions for PCOS machines; 2). the ultra-violet detectors that would prevent use of fake ballots; 3). the voter verification receipt that would inform voters whether the machines registered their votes properly or not, and 4). the mandated use of individualized digital signatures that would secure the voting machines from hacking. Glenn Chong masterfully enumerated all the sins of Comelec-Smartmatic. What is heart-breaking, stressed Glenn Chong, is that despite "clear uncontroverted evidence" of the mysterious digital lines affecting as much as 6.278 million ballots in the 2013 elections, and involving as much as 150.686 million (!) wrongly-counted votes, Comelec still pursued its spending spree involving P12.641 billion of tax-payers' money to invest in more of the same nefarious voting machines for 2016. Glenn argued that considering that the same Smartmatic is poised once more to manage the 2016 elections, "We demand the effective restoration of the four main security features of the AES system and full compliance of the automated election system law by the Comelec itself---in order to establish transparency and ensure the credibility of the 2016 elections." We citizens cannot remain indifferent to the call of these two vanguards of democracy, Greco Belgica and Glenn Chong, who are risking their lives and fortunes in their tireless advocacies for a better world for Filipinos. As Archbishop Oscar Cruz says, Nabubuhayan tayo ng loob sa pinakikitang katatagan ng mga leaders. We should support their advocacies. This particular sequence may be named the favourite amongst fliers. chanel replica sequence has the routing pc that enables the individual installed away using the view in order to unravel routing trip calculus. Addititionally there is the actual rado replica aeromarine sequence. These types of wrist watches within the aeromarine sequence happen to be constructed in order to outlast any kind of property, atmosphere as well as marine problems. Regardless of exactly what your own flavor or even wishes exist is actually hublot replica uk which can assist you to via any kind of scenario. Breitling wrist watches happen to be close to for any considerable time period which means you understand that they're reliable as well as reliable. Breitling wrist watches happen to be which may outlast every other iwc replica watches which means you understand you are obtaining specifically what you need with regards to using a really outstanding view. A person obviously don't would like your own costly Rolex watch to appear filthy as well as aged following simply a number of days associated with selecting this. Would you? The solution after that would be to detox your own rado replica utilizing water frequently. You will discover cleaning options with regard to Breitling watches which may be offered at the actual Rolex galleries too that may be acquired as well as utilized with regard to cleansing the actual watch. Oakville Family Lawyer- Lydia Moritz is a reputable law firm focusing on dealing with all kinds of family matters. We provide you with the most affordable and result-oriented services so that you can resolve your family law disputes without any trouble. Contact us now to get the best legal consultation!